As it turns out, carving out the time to work while traveling is a LOT harder than I ever imagined. Or, rather, it’s a lot harder to prioritize my time so that jewelry-making gets an equal share (it’s just so easy for the studio time to get squeezed out, in favor of cycling and exploring new towns and talking to people and connecting with our homestay hosts and relaxing in those few moments we get). And now that it’s officially winter all around us, I have to contend with the cold factor too. A few days ago, we planned a rest day Pancho Villa State Park. ‘Great!’ I thought, ‘I can get some work done on these pendant ideas that have been floating around in my head for weeks.’ And then it rained. All freakin’ day. And at about 2pm, it was a whopping 38 degrees outside. Not exactly conducive to setting up shop at a picnic table. So, I’ve been spending a lot of time thinking about making jewelry and how to fit it in to our trip. I haven’t come up with a definitive answer yet, but I thought I’d share some of what’s rattling around in my head. In the meantime, I wanted to introduce another idea that’s rolling around in my head… collaboration! One of the other things that I have wanted to do while traveling is connect with other jewelry and metal artists around the US. I have done an absolutely crappy job of this so far, so I’m really trying hard to make it more of a priority. What I’m thinking so far is this… What if I could connect with other artists in various parts of the US, as we travel through, and spend a couple days sharing ideas and studio space? It could mean working together on some sort of collaborative finished product or using the opportunity to learn (together) about some new skill or just spend the time swapping tips and suggestions. Or any number of other ideas that I haven’t made their way into my head yet. Interested? Our rough route for the next few weeks is as follows… Alamogordo, New Mexico… Marfa, Texas… Big Bend State Park… Texas Gulf Coast… San Antonio… Austin… Ft. Worth… New Orleans… then on to the East Coast somehow and then North and then back toward the West Coast. If you’re along that route, or near that route, or think we should make our route go through your neck of the woods… and you want to work on some sort of collaborative something… let me know (you can use the contact form here or email me directly at: tangerinetreehouse AT gmail DOT com). I’m excited just thinking about the idea, so we could start brainstorming today. Laura, you guys are welcome in Fort Worth for sure! I don’t have a lot of space at my work bench, but you can borrow it for a couple days, and/or I can set up an extra table so we can collaborate on something. That sounds like a lot of fun. Please email me! 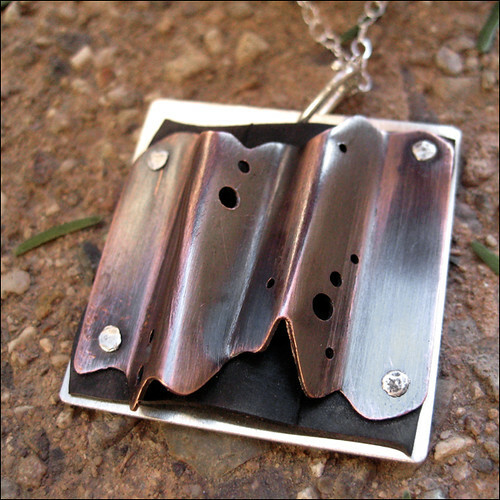 Hi Laura, I love that you incorporated the bike tube in your new piece, the desert and rolling hills…genius! I really see a wonderful collection coming. Pieces of landscapes, pieces of you and your adventure of a lifetime. Jewelry that has such meaning.